We are forced to stay indoors during the hot summer months, so we should attempt to make our home interiors cooler and soothing so that staying indoors doesn’t become painful. Here are a few tips by which you can turn your home into a cool haven and beat the scorching heat, without having to invest much. To start with, change your old windows , as old windows tend to make the house hot by allowing heat transfer into the rooms. Consider putting up good quality vinyl or wood windows, and windows that use low e-glazing on the glass, which cuts down on UVs and heat entering the rooms from outside. Also consider putting horizontal blinds or shutters on windows. When using blinds, position them so the sunlight is directed upwards towards the ceiling. This imitates the effect of a skylight by providing natural sunlight without having much impact on the cooling. 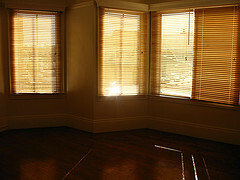 Wood blinds are preferable to metal blinds as metal blinds tend to conduct heat into a room. Light : Lighting is another important aspect, to be taken into consideration. During summer months, try to minimize overhead lighting as it generates heat. To read or study, you can use a table lamp instead of switching on an overhead light. Every time you turn on an overhead light, you not only burn energy through the light source, but also generate heat that your AC or fan must work harder to cool. Try using Compact fluorescent light bulbs instead of the standard incandescent bulbs, as they use less energy and produce less heat. Upholstery : The type and color of fabric also determines the amount of heat produced in a room. You should go for light colored fabric slipcovers during the summer months , like white muslin slipcovers for the upholstery. Similarly, heavy wool carpets should be rolled up in the summer and light colored cotton rugs or durries can replace them, as they tend to accumulate less heat than the haavy carpets. This follows the basic principle that dark colors absorb and hold heat while light colors reflect heat. 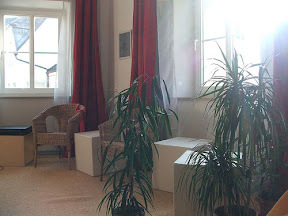 Placing some plants indoors can also give a cooler effect to the room. Glossy evergreens like dracaenas and ficus plants are big enough to be used as stand alone plants. They also fit well into a large living room or a large dining area. Select plants with glossy leaves and elegant shapes. Place them in attractive containers to add beauty to the room. Brass containers give an ancient look while terracotta ones bring in an earthy feel to the ambience. Water structure : These days its quite a fashion to install a water structure inside the house. A small fountain inside your home or even a terracotta container filled with water and sprinkled with flower petals will make your home feel cooler.